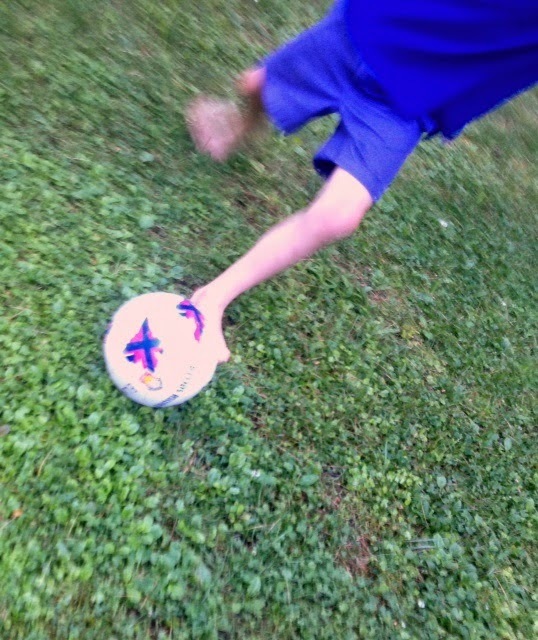 There’s a makeshift soccer “pitch” wedged between the long grass of our wild east field and the stone wall along the driveway, soccer balls lay scattered around the yard, and my children have been allowed lately to eat their lunch – and occasionally their dinner – in front of the television, which broadcasts several soccer games each day. It’s a World Cup year, and it seems we have a serious case of Futbol Fever. I have loved soccer for as far back into my childhood as I can remember. American football and field hockey reigned supreme in the autumns of the town where I grew up. But soccer was always my game. Sure, as a kid I shot baskets in the driveway and played touch football in the backyard on Thanksgiving, but I also scarred the garage doors (and broke at least one light) kicking a ball against them when there was snow blocking my way to the backyard backstop my dad built to feed my soccer addiction. I don’t like watching American football and never have. Basketball bores me to tears. Baseball I can get into come October, but the six months prior to playoffs are much too long, with far too many games, to hold my interest. Hockey I love, although I don’t watch it much anymore. I don’t watch much television at all, really, in these days of fitting work and downtime around playing with and caring for three active kids. But for the past two weeks, the tube has been turned on and tuned to ESPN for much of every day. I like the noise and the color of the World Cup, even if it’s just playing in the background. 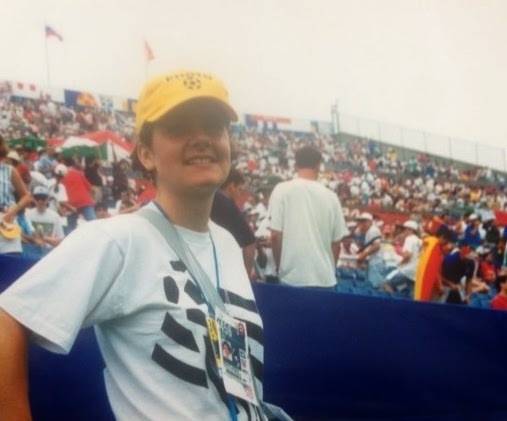 When I was a junior in college, the United States hosted the World Cup, and I landed a volunteer post in the press tent at the Foxboro venue. For one game – the quarterfinal between Italy and Spain – I was on the pitch, just behind the goal line, as a film runner. The photographers would dump a roll of finished film from the camera, toss it to one of us while reloading, and off we’d sprint to wherever it was they developed the photos. It was a completely unglamorous and entirely amazing job. I got to be on the field during the pregame team warm-ups and for most of the game. I was on the field with some of the world’s best footballers. I was in heaven. I also attended a few games as a spectator that summer. Outside the stadium before kickoff, people from different places, speaking different languages and draped in the flags of the day’s opposing countries, would gather together to smile for group photos. We were there for the competition, yes, but also to celebrate – our teams, our cultures, and the Beautiful Game. I already loved soccer, but 1994, that summer I was briefly and wholly immersed in the world’s favorite game, was when I fell in love with the World Cup. I love the pageantry of it (and I don’t mean the dives on the field – Oy! ), the singing and dancing and wild color in the stands. The sense that this sport, each single game, means something huge to people around the world. This World Cup summer my son has been most interested in the games. He asks each morning who will be playing during the day. When we come home from wherever the day’s activities have taken us, we check the scores and game highlights together. If the U.S. is playing an evening game, the kids get to stay up late and watch until the final whistle. They have learned, during close games, to keep a safe distance from me on the couch, lest a piercing yell be sounded too close to their little ears or a flying elbow inadvertently make contact while celebrating a spectacular goal. They have been delighted by the fans of many countries wearing face paint and funny wigs. I have explained, several times (and to no avail), the offside rule and what happens when a player gets a yellow card. We have looked at maps of Europe and Africa and South America to find the countries playing and learn a little bit about them. The other night I came outside after cleaning up the dinner dishes to find the kids involved in an impromptu soccer game. They play barefoot in the grass, just like other kids all over the world (although probably not as incessantly). They giggle wildly through each Kids vs. Mom match. They’re learning to work together, as a team. Sometimes I don’t even let them win; they come by that result by luck or burgeoning skill or, most likely, a combination of the two. Futbol Fever burns on. May it linger long beyond the final whistle of this year’s World Cup. Original content by Meghan McCarthyMcPhaul, posted to her Blog: Writings From a Full Life. This essay also appears as Meghan's Close to Home column in the June 26, 2014 edition of the Littleton Record. There was a time, not all that long ago, when I could claim I was the mother of three children under the age of 3. It was something of a badge of honor, a sort of twisted brag uttered in sheer exhaustion. Well, school ended this week, and I can no longer claim to be the mother of even one preschooler. I am now the mother of two 2nd graders and a kindergartener. 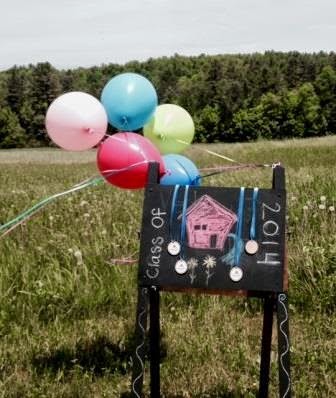 The end of each school year marks a new milestone in the march toward growing up. I can clearly see, at the dawning of summer vacation, how my children have grown – in stature, knowledge, and ability – since the start of the school year. The conclusion of this year marks a particularly big change for our family, as we say so long to a place that has nurtured my children through their earliest classroom experiences. Each school day for the past four and a half years, I have driven down a bumpy back road along the Gale River to deliver a child – or two, and for a short time all three together – to preschool. In the time my family has been at this school, the faces of the children and the parents and even some of the teachers have changed, the fields of the farm on which the school sits have been brought back to a life of growing food, and my kids have skipped and played and grown in this sacred little center of learning. In four and a half years as a preschool mom, I have changed, too. In the beginning, I was the nervous, first-time-at-preschool parent, walking through the door with a 3-year-old grasping each hand. All the other kids, older than my son and daughter then, seemed to know the routine. All the other parents seemed unbothered by leaving their children here, in the small, bright classroom with the kid-sized chairs and tables, and going about their lives for the day, while I was a mess of nerves and emotion. Soon, of course, we all learned the routine of preschool. And in what has become one of the things I most cherish about this place, we were welcomed into the family, a family that changes every year as the 5-year-olds move on to kindergarten, the younger children grow into the role of “big kid on (preschool) campus,” and new students arrive with their own nervous parents in tow. Children seem to take these transitions – finishing another year of school, reaching the next birthday, learning some new skill – in stride. For parents, though, the waning of one phase of childhood into the waxing of the next can be a bit emotional. Each milestone our children reach marks the beginning of something new and, hopefully, good – but also the ending of something else. My littlest one was a baby when her siblings started preschool, and it is not easy for me to let go of this phase of my family’s growing up, even as I want nothing more than for my children to continue to learn and grow and be happy in their next steps. This week, I made that journey to preschool for the last time as a parent of a preschooler. I’m sure we’ll come back for an occasional visit. But come fall, my daughter will head to the “big school” with her older brother and sister, who remember their preschool years fondly, but have moved on to other teachers, other friends, a bigger playground, school lunch, reading and adding and learning more all the time about the world around us. It is strange knowing that I will not travel this road every morning and afternoon next year, not walk up those five wooden steps and through the door to greet the teachers and discover the fun morning activities of the day. This has been a happy place for each of my children, and I will forever be grateful that they started school here, with these teachers, these families, in this place. On the first day of kindergarten at the end of summer, I will once again send my baby into a world that is unfamiliar, new, sometimes a little scary (sixth graders are considerably bigger than kindergarteners, and they share the hallways). Once again, she will navigate some of this new world on her own, but she’ll also have her big brother and sister to show her the ropes – at least during recess and school-wide activities – just as she did when she started preschool. Someday, I’m guessing long before I’m ready for it, I’ll be able to claim I am the mother of three teenagers. But that’s too far down the road of life to think of now. Kids grow up too darn fast, as every parent knows, and it’s officially summer vacation. I’m heading out to play with my three grade schoolers. Summer, after all, is as fleeting as childhood. Original content by Meghan McCarthy McPhaul, posted to her Blog: Writings From a Full Life. This essay also appears as Meghan's Close to Home column in the June 13, 2014 edition of the Littleton Record.